Do you know your pulse width from your polyphony? Arpeggiator from attenuator? Synthesis is a science that dares you to ask the right questions - in this handy article, we've compiled basic descriptions of some of the most common (and mind-boggling) terms you'll come across. There’s a lot to synthesizers. Components, parameters, varieties – despite their diversity and complexity, the terminology is pretty universal. That doesn’t make it any less headache-inducing though, particularly for a novice. Fear not; in this jargon buster, we’ve covered some of the most common phrases and terms you’ll come across – to save you some research. Go forth and make noise! Heads up: there’s a lot of stuff in here, but there’s always a chance we’ve missed something. Give us a shout if you’d like to see something added! 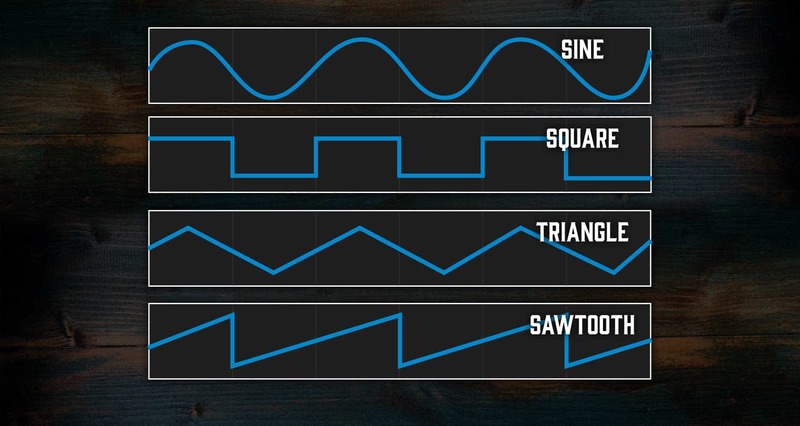 Unlike the more common subtractive synthesis (more on this later), additive synthesis combines multiple waveforms with your oscillator(s) to produce complex textures. ADSR is short for attack, decay, sustain and release. These are the four elements of a standard envelope filter. A term for the volume of a tone or waveform. On an oscilloscope, it’s represented by the height of the waveform. Bonus round: analog or analogue? Analogue is the traditional spelling of the word, originating in British English. Analog is the American spelling. In the synth world, both spellings are used, but analog is more common due to many synth pioneers being US-based. An arpeggio is a chord or group of notes played in sequence, often (but not always) in an ascending/descending fashion. Naturally, an arpeggiator takes care of this for you. It’ll take a group of notes (often taken from a MIDI source such as a keyboard controller) and split them up into a sequence for you. This allows you to easily create patterns, melodies and moving textures simply by inputting chords into your chosen synth! Broadly-speaking, attenuation means the reduction of the strength or volume of a signal. In terms of musical gear, it often refers to reducing the volume of a guitar amp without affecting its tonal behaviour. With synths, it’s very similar, but it can affect a number of different parameters as opposed to just volume. As the name implies, this common synth parameter controls the cutoff of certain frequencies, acting as a filter. This control can be found on numerous filters, controlling the extent to which certain EQ frequencies are removed. When you tweak this control, you’ll often hear your sound change drastically. CV stands for controlled voltage. A controlled voltage can be used to control pretty much any parameter in an analog synth, including pitch and gate. Synths almost universally abide by the 1V per octave rule – for example, the frequency generated by a 3V signal is one octave higher than the frequency generated by a 2V signal. Other components controlled by voltage include a VCA (voltage-controlled amplifier) and VCF (voltage-controlled filter). Essentially the opposite of analog, and the basis for the vast majority of modern tech. Digital data uses binary code – 0s and 1s – to communicate. Because of this, digital waveforms are not as smooth as analog, which many synth users claim causes a huge difference in sound. 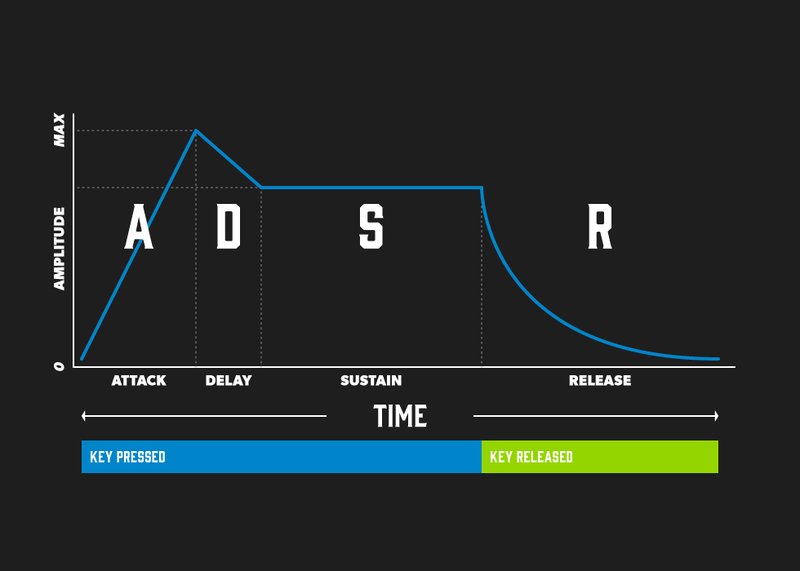 At the start of this article, we covered ADSR; check out the diagram if you haven’t already! Eurorack refers to the most common (nowadays borderline universal) physical format of modular synth gear. It was originally developed by German manufacturer Doepfer in the early ‘90s. The design included a height of 133.4mm, width measured in HP (1HP = 5.08mm) and connectivity via 3.5mm mono CV cables. The format was gradually adopted by a number of manufacturers, who saw the advantage of users being to combine different types of modular gear. Nowadays, everyone from Moog to Roland offers Eurorack-compatible modular synth equipment! (above) a typical Eurorack setup. Notice the 2 levels, with individual modules screwed in at different points along the case. The word ‘pole’ often comes up when talking about filters. The more poles a filter has, the more dB of control you’ll have over your chosen frequency. A 4-pole filter will be able to filter out more frequencies in greater detail than a 2-pole filter, for example. Frequency modulation is when you use a controlled voltage to affect an existing oscillating waveform. This could affect pitch, filter, volume – a number of parameters. FM synthesis is when this is used to create totally new sounds by drastically modulating a waveform until it transforms into a totally different tone. If you modulate the pitch of a signal and gradually increase the frequency, you’ll notice your tone adopt a totally different pitch and sonic character. A gate signal is essentially an on or off signal. The most common application of a gate signal is when you press a key on a MIDI keyboard (opening the gate) and release it (closing the gate again). Gate signals can also be used to trigger envelopes, filters, and sequencers among other things. This stands for low frequency oscillator. Oscillators usually generate waves at such a frequency that the oscillations are no longer individually discernible; they instead clash together forming an audible tone. When you slow it right down, you can hear it ebbing and flowing – this is used for rhythmic sounds, modulation effects like chorus and phaser, and much more. The universal digital language originally developed in the 1980s by Dave Smith, Roland and a number of experts in the field. It stands for Musical Instrument Digital Interface, and can communicate information on pitch, velocity, duration, modulation and much more. Analog synthesizers convert MIDI into controlled voltage signals that they can understand. (above) a Native Instruments Maschine, with MIDI in and out connectivity – note the 5-pin connector, the most common form of MIDI connection. Broadly speaking, modulation describes routine changes in a signal. For example, if you modulate the amplifier component of a synth, you get routine dips in volume – the result is a tremolo-type sound. You can often modulate just about any parameter of a synth to get different sounds; pulse width, pitch, cutoff frequency, the works! Modular synthesis refers to the use of multiple units, also known as modules, to build your signal chain from the ground up. This allows you to carve out a sound that’s entirely your own, providing plenty of flexibility. Modules can come in many forms, from Eurorack to desktop units. Many analog synths feature noise generators, which can add electrical noise to your signal. The result varies from breathy vocal effects to fizzing distortion. There are many different types of noise, including white noise, pink noise, brown noise – each of which has a different tonal quality. An oscillator produces a signal frequency with an audible pitch. The oscillations of a signal frequency are sped up until they result in a note that you can hear. This is usually the beginning of a synth’s signal chain, being the basis of the note that you can hear. The more oscillators your synth has, the richer/fatter the tone will be! Monophonic – only 1 voice at a time. Paraphonic – 2 voices, but sharing a common filter, envelope and amplifier. Duophonic – 2 voices with their own respective filters, envelopes and amplifiers. Polyphonic – multiple voices. Analog synths commonly offer 4, 8 or 16 note polyphony, while digital synths can offer a whopping 128 voices, or in some cases, more! This refers to the time it takes for a waveform to go from its peak (highest point) to its trough (lowest point). Adjusting the pulse width does not affect the frequency, just the amount of time that the waveform spends up high or down low. Modulating this parameter is popular, as it creates a cool phase-like effect. The resonance is the amount of boost applied to the cutoff frequency. Imagine an EQ diagram; if your cutoff control is around 200Hz and you crank the resonance control, you’d see a big old spike at that exact point. This emphasises certain harmonics and can have a huge (sometimes destructive!) effect on your sound. This function could be best described as ‘what it says on the tin’. It’ll latch onto a point in a signal’s waveform – i.e. ‘sample’ it – and hold onto it for a determined period of time until the next point in the waveform is sampled. In simpler terms, it turns a smooth waveform into a jagged one with steps. Sometimes these steps are evenly spaced, sometimes they’re not. If used carefully, it can add movement and shape to an otherwise static sound. This refers to the feedback produced by cranking the resonance control (mentioned earlier). After a certain point, a boost in resonance will produce feedback that adopts a tone of its own, essentially becoming a new sinewave. This means you can essentially use your filter as a tone generator in itself, if you’re that way inclined. Similarly to an arpeggiator, a sequencer will play a selection of notes or tones in an order determined by you. Unlike an arpeggiator however, the notes in a sequencer can be dialled in one by one, often with the option of adding rests, ties and automation/effects. Sequencers can be used for everything from drum patterns to ambient ostinatos. They come in many forms, some standalone, some built-in to synthesizers. (above) the Korg SQ-1, a popular and affordable sequencer. The start of it all. A sinewave is a basic analog waveform with evenly-spaced curves and a similar smooth tone. It’s often referred to as the ‘fundamental’. As the name suggests, subtractive synthesis refers to the use of filters to remove certain frequencies from the tone of a waveform. By removing frequencies, you can easily alter the shape of your sound; create a hefty bass tone, a sharper lead sound or anything in between. Sine – as mentioned earlier, a smooth, rounded waveform with a ‘pure’ tone. Sawtooth – jagged in both sound and appearance, often abbreviated to ‘saw’. Triangle – like sawtooth but symmetrical. This results in a smooth sound but with more top-end detail than a sinewave. Square – a waveform consisting of evenly-spaced right-angled periods. A very sterile, edgy sound. Well now – hopefully you’re feeling refreshed and informed by now. And hopefully that headache is gone. Or perhaps we’ve made it worse. All we know is that you’re ready to go and explore the weird and wonderful world of synthesis. If you like to know more, head over to our site to see our full selection of synths and workstations. Alternatively, while you’re here, check out the rest of our learn content.